The Unionville boys' golf team remained unbeaten Tuesday with a 177-208 win against Kennett at Hartefeld National Golf Club. 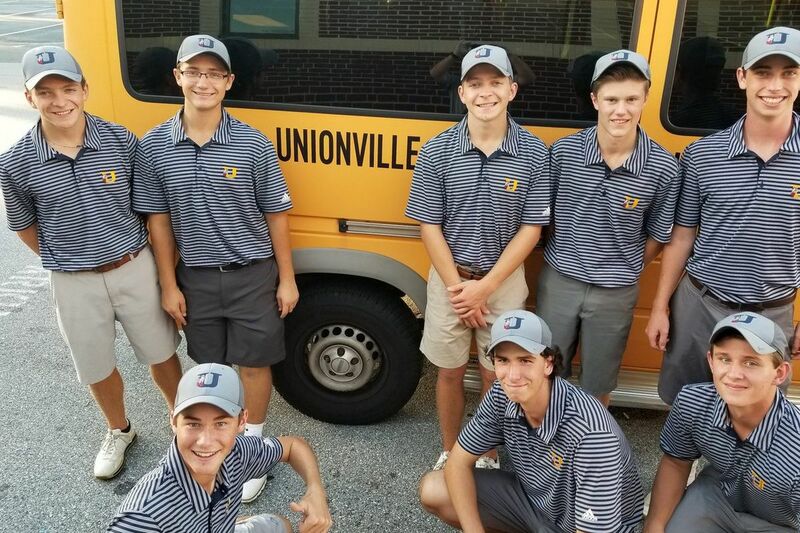 The Unionville boys' golf team remained unbeaten Tuesday with a 177-208 win against Kennett at Hartefeld National Golf Club. Richie Kline shot a 2-under-par 34 for the 11-0 Indians, who will play Great Valley on Thursday at Chester Valley Golf Club. Jackson Muller netted two goals as Avon Grove held off Oxford, 3-1. Martin Meenan and Rob Salvadore scored in Cardinal O'Hara's 3-2 win over Bishop McDevitt. Downingtown East blanked West Chester East, 2-0, behind goals from Zach Delone and Luc Rising. Koffi Adjaglo and Jacob Graff had two goals apiece as Palumbo edged Lincoln, 4-3. Cailin Panacek recorded a pair of goals in Gwynedd Mercy's 2-0 victory over Mount St. Joseph. Allie Bofinger's overtime goal gave Little Flower a 1-0 triumph over Cardinal O'Hara. Constitution rolled past Washington, 5-1, thanks to three goals from Ricshawn Walker. Damaris Gimenez added two goals. Claudia Zanine notched two goals as Upper Moreland defeated Truman, 3-1. Merion Mercy beat St. Basil, 5-0. Chloe Abramowitz (6-3, 6-4), Maddie Urbano (6-4, 6-4), and Maddie Ott (6-2, 6-3) won their respective singles matches. Downingtown West defeated Great Valley, 7-0. Jordan Bradley played a dominant opening match as she won 6-0, 6-0 at No. 1 singles. Holly Koons (6-0, 6-0) captured a second singles win and Sophia Koons (6-1, 6-0) came out on top in third singles.